During my last webcast about Project Aristotle at OpenLiberty Project, I introduced a new concept called Identity Modality. The idea occurred to me as I was trying to describe the different types of identity exchange protocols and methodologies and how they impact developers. I noticed there are several different ways and modes in which information is exchanged. There are times when the user is present (online) or is absent (offline), there are times when the transfer occurs through a backend system (such as with a database), and times when it occurs directly via the user. Finally, there are simple transactions (atomic) and then there are multi-step or workflow like transactions. If you take these 3 different dimensions and place them on a 3-dimensional axis and plot popular means of exchanging identity information (based on typical usage), there are some interesting observations that can be made. What struck me is how the notion of a front-end or browser-based protocols create a 3rd dimension of information exchange. The diagram also shows why SQL based systems are so ubiquitous - because it fully encompasses user-online/offline, atomic vs. workflow based transactions. Likewise LDAP, covers a smaller area, because it was intended as a lightweight, atomic (single-operation at a time) protocol. Where SQL fully exists in 2-dimensions, LDAP exists only in the atomic space handling both user online and offline scenarios. 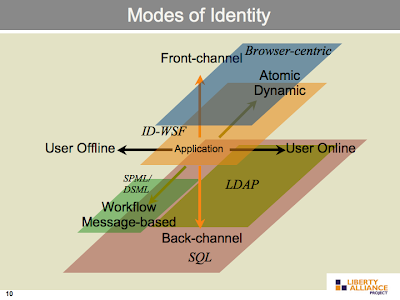 Considering the challenges of developers writing applications and the objectives of Project Aristotle, the chart suggests why applications dealing with multiple modes of identity communication face a huge challenge. It becomes one the reasons why most applications end up with their own identity "silos" -- it's much easier to ignore systems outside the application. One of the objectives behind the architecture of ArisID is to be able to handle all of these modalities through a single API. A loosely-coupled architecture means Identity modality does not have to be restricted to a specific hard-coded set of choices, but rather be configuration-based leveraging policy and environmental requirements.